The present and future of automated household machines programmed to do your bidding. 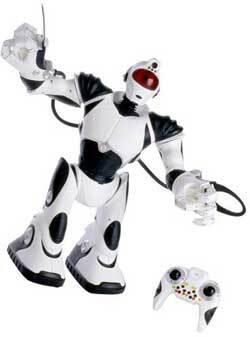 For 2005, WowWee introduces Robosapien V2. Robosapien V2 brings the fluid movement and biomechanical agility of Robosapien to a whole new level. Gaining a whopping 10" in height, Robosapien V2 now has full range of motion and the ability to pick up, drop and throw objects with his finely tuned precision hands. Advanced agility allows him to bend over and twist from side to side, so he can now sit, bend, lie down and stand up. 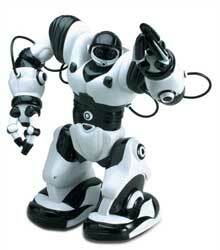 Robosapien V2 will interact with his surroundings, and even responds with a 'real voice'.Robosapien V2 can talk! Fully equipped with infra-red radar vision, Robosapien's V2 moving eyes with blue LED lights can detect obstacles, track movements and take objects handed to him. Sensory features include a vision color system that enables Robosapien V2 to recognize objects and skin tones; he can wave when he sees you and reach out to shake your hand. A stereo sound detection system allows him to respond and react to noises in the environment. Robosapien V2 comes equipped with 'laser' tracking; trace a 'laser' path on the ground and he'll follow it. And, Robosapien V2 couldn't carry the Robosapien name if he didn't possess a one-of-a-kind attitude-filled personality! 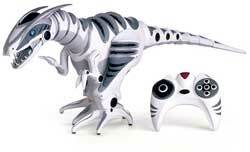 Robosapien V2 is so advanced he can even control his new friends - RoboraptorT and RobopetT. We get the inside scoop on the third generation Robosapien direct from its creators. Own a personal robot in your home! Designed by a NASA scientist, this 14-inch Robosapien remote-controlled robot is packed full of realistic features. You can control it to walk or even kick. It can fetch objects on the floor, or groove to music. Robosapien communicates in grunts and physical actions. Place objects in front of him, and he can push or shove it out of the way! Simple enough for kids, advanced enough for adults, Robosapien is like a video game character for the real world.